Thoroughbred racing returns to historic Del Mar Wednesday when the 79th season begins with a ten-race program highlighted by the seaside track's traditional opening-day feature, the $100,000-added Oceanside Stakes for three-year-olds at one mile over the infield Jimmy Durante grass course. Post time for the first race is 2 p.m. Presented on a five-day-a-week schedule, Wednesday through Sunday, the 36-day meeting will feature a 41-race stakes schedule worth $7.3 million topped by the $1 million TVG Pacific Classic on Saturday, August 18. The season will conclude Labor Day Monday, September 3. The Oceanside Stakes attracted a full field of 14 sophomores, with two on an also-eligible list, and shapes up as a wide-open betting contest with several entrants having performed well in stakes competition. The field, in post position order: Arawak, Gary Stevens to ride; Texas Wedge, Flavien Prat (Del Mar's leading rider in 2017); Pepe Tono, Alonso Quinonez; Artie Be Good, Stewart Elliott; Desert Stone, Corey Nakatani; Shane Zain, Mario Gutierrez; Restrainedvengeance, Evin Roman; Faversham, Tiago Pereira; Move Over, Tyler Baze; Calexman, Giovanni Franco; Heartfullofstars, Santiago Gonzalez; Soltero, Joe Talamo; Afleet Ascent, Kent Desormeaux, and Respect the Hustle, Tyler Conner. Also eligible are More Honor, Pereira, and Risky Proposition, Talamo. 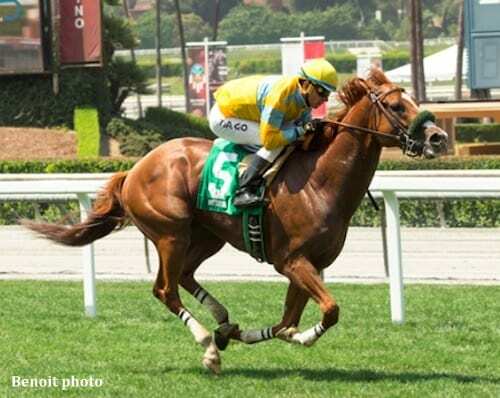 This entry was posted in Racing and tagged Del Mar, del mar thoroughbred club, faversham, oceanside, Oceanside Stakes by Del Mar Thoroughbred Club. Bookmark the permalink.